This past weekend the women’s team played in a round robin tournament with three nationally ranked teams (#12 Bowdoin, #24 Wellesley, and #30 Rochester). 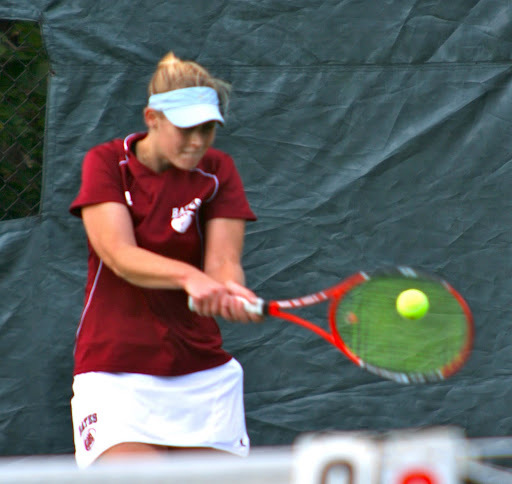 The bobcats fared well on Friday and got wins out of 3 first-years. 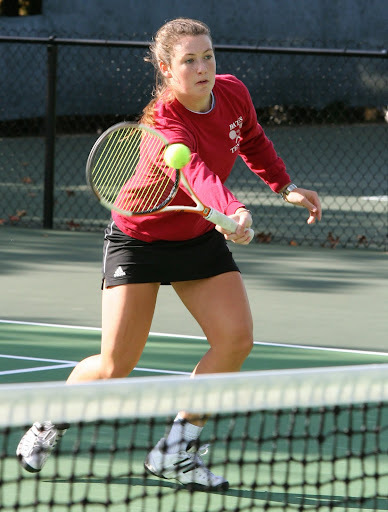 Audrey Grauer, playing in her first college match, beat her Rochester opponent 6-1 6-0 as she relentlessly attacked the net and gutted out many long deuce games. Ali Hakusui got her feet wet and also beat her Rochester opponent 6-1 6-0 in convincing fashion. Keenan Brent beat her Wellesley opponent 6-2 6-4 as she transitioned well off of short balls and worked hard for every game. Saturday started with doubles and the bobcats performed very well, getting better with each match. 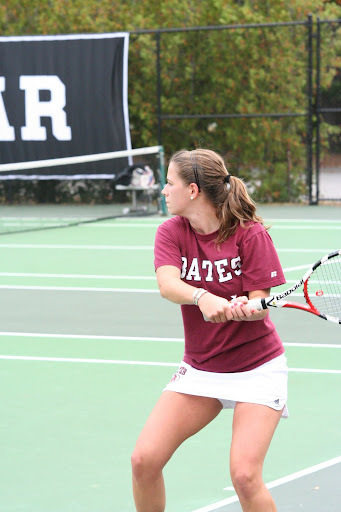 First-years Ali and Audrey won two matches, knocking off Rochester and Wellesley teams. Meg and Elena knocked off a highly ranked Rochester pairing and lost a heartbreaker to Wellesley in a great effort. Lucy and Jacqui beat another Rochester pairing in their second match as well. Erika and Kristen came up short in their matches, but all three were very close, 8-5 being their largest deficit and they played very well. In singles, Kristen got on the board taking out her Rochester opponent 6-1 6-2, attacking at every opportunity and keeping her foot on the gas. Audrey won her second singles match of the weekend 6-1 6-2, showing the poise of a seasoned veteran. On Sunday Erika started off the morning with a battle. She got down quick 6-2 before making some adjustments and gritting out the second set 6-1. In the tie-breaker she got down 5-2 and then down two match points 9-7. However, she would not be denied and committed to working for every ball and ripping it big to safe targets. She won 5 of the next 6 points and was clutch under pressure to seal the win over Rochester. She had a second match and won this one convincingly 6-1 6-0. Kristen also had a tough one against her Wellesley opponent and after losing the first set 6-3, she came back to win the second set 6-1 and the breaker 10-5. Overall it was a great weekend for the bobcats. We played three teams ranked ahead of us and had some very strong results. For only our second tournament of the year it was very promising. Our doubles improved with every match, and our singles is well on its way. We proved we can hang with nationally ranked teams and have the potential to be one of those teams this spring. The women will be working hard this offseason, getting ready for our spring matches, which will start mid February when we travel to California.